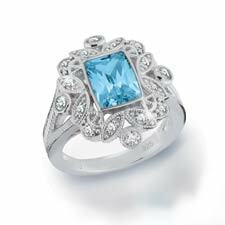 Clear Blue Topaz skies and bursting blossoms of sparkling CZ’s will put spring in your step and joy in your heart when you wear this bold and fashionable Sterling Silver ring. Affordable jewelry that has flash and attention grabbing gemstone sparkle. Each piece will add pizzazz to any outfit, on any occasion, and is a must for everyone’s jewelry wardrobe. A bit of “bling,” a little nail polish, great shoes and you’re on your way to a great day. Every woman should treat herself to a pick me up once in a while. We deserve it. Color your world with big, bold jewelry pieces... Original designs available exclusively from the Concorde Collection.